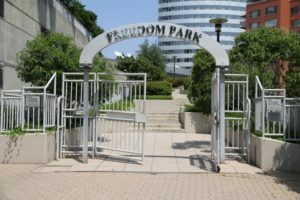 Greater Greater Washington ran an interesting article yesterday comparing Rosslyn’s Freedom Park to a newer, more well-known elevated urban park — New York City’s High Line. 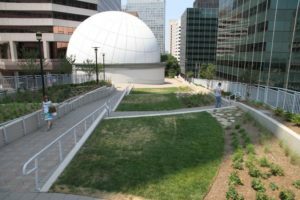 For those who weren’t around in the ’70s, ’80s and early ’90s, the idea of Rosslyn’s “Loop Road Bridge” may seem a bit wacky. N. Lynn Street does get backed up at rush hour, but hardly enough to justify a whimsical, Disney World-esque elevated highway that ran in between skyscrapers and over existing roads, and which did nothing to alleviate traffic on the real bottleneck: the Key Bridge. 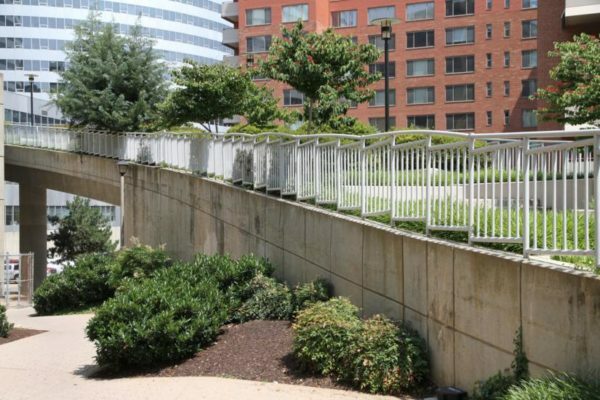 At the time, however, transportation planners believed that the Loop Road Bridge was “the final piece to a road system that would reduce traffic in the Arlington high-rise district,” as Washington Post reported Charles W. Hall wrote in April 1993. Nonetheless, after 20 years of planning, construction on the bridge abruptly stopped in 1990 when significant engineering problems were discovered. The county fired its construction contractor and a legal battle ensued. The bridge — unfinished and unfit for vehicle traffic — remained an eyesore until 1994, when the County Board finally voted to turn it into a park with the help of a developer. 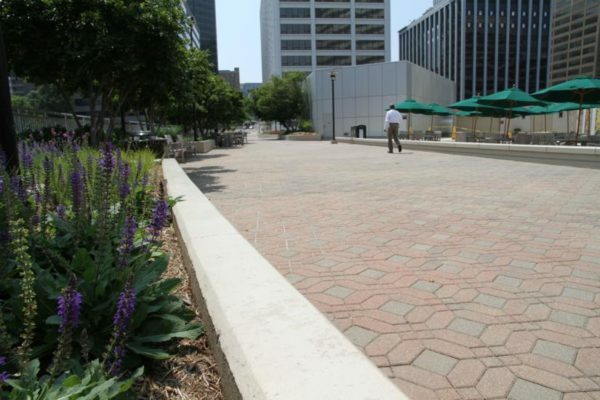 Greenery, a fountain and covered dining areas were envisioned for the park. Concerts, events and food vendors were also part of the plan. 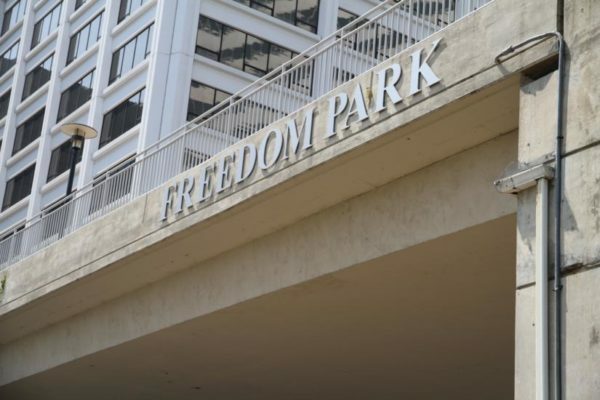 Only part of the vision has materialized — Freedom Park does have planters and greenery, and is a somewhat popular destination for workers on their lunch breaks, when the weather is nice. 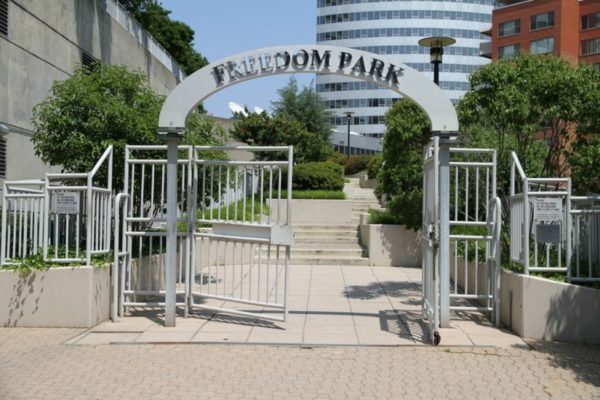 But now, in 2011, the park can hardly be considered the vibrant destination that county leaders had hoped. The fact that the Newseum moved from Rosslyn to D.C. in 2008 did not help matters. The museum made use of the park for some of its artifacts. 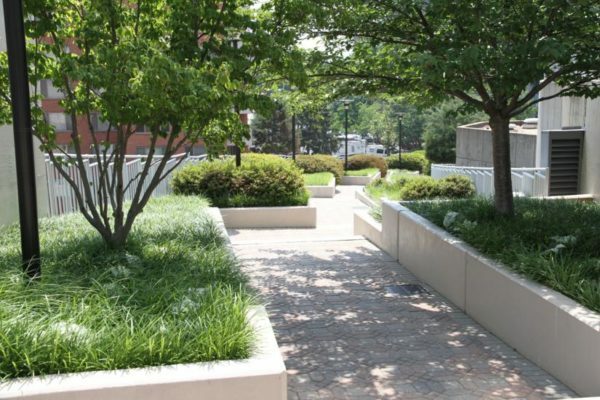 “The opportunity to create a park… is a substantial amenity for the community, and it links nicely to the Newseum, which is expected to bring millions of visitors to Arlington,” County Manager Anton Gardner told the Post in March 1994. So far Artisphere, which opened in the Newseum space last year, has not utilized the park. More photos, after the jump.